I am indeed in a lemony state of mind and present you these cookies: one of the most delicious I have ever baked. Top 3 delicious – really. The curd is wonderful – much better than the one I made a while ago - and goes perfectly well with the buttery dough. Try them and tell me later. Start with the curd: place the lemon juice, zest, butter, sugar and eggs in a heatproof bowl over a saucepan if rapidly simmering water. Cook, stirring continuously, for 20 minutes or until mixture has thickened slightly. Pass through a sieve into a glass/ceramic bowl and cover with plastic wrap touching the surface of the curd to prevent a skin from forming. Refrigerate until cool and thick. Make the cookie dough: preheat the oven to 180ºC/350ºF; line two large baking sheets with baking paper. Place the butter, sugar and vanilla in the bowl of an electric mixer and beat until light and creamy. Add the egg and beat well. Using a spatula, stir through the flour and baking powder to form a dough. Roll 2 teaspoons of the mixture into balls and place onto prepared sheets 5cm (2in) apart. Press deep dents into the middle of the balls with the back of a small teaspoon, wetting the spoon if the dough starts to stick – I though it was easier to do that with my index fingertip. 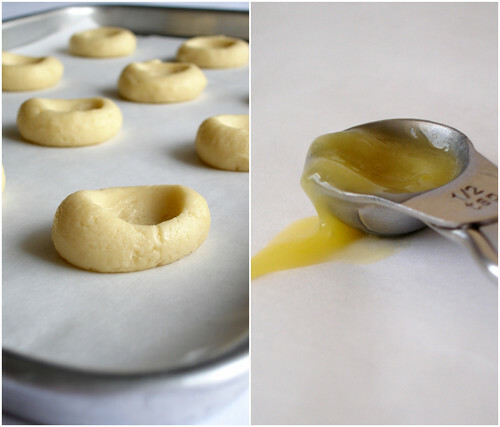 Fill each of the indents with ½ teaspoon of the cooled lemon curd and bake for 10-15 minutes or until golden. these looks great!! I love anything lemon!!! I do have 2 jars of home made slow cooker curd in the fridge, tomorrow night it's cookie night! Oooh... I've been thinking about lemon curd lately. I may have to give these a try. Yum! Oh yummy. These might be the perfect cookie! Can't wait to try them! p.s. Saw this on tastespotting.com and had to check them out! I feel like I could eat them all, Patricia! Is the texture of the cookie chewy or crumbly? MMM! Who can say no to lemon curd? 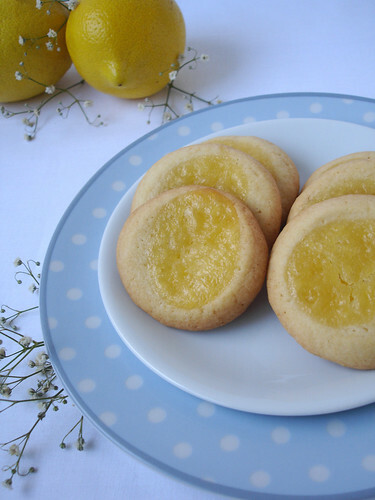 Those cookies look very yummy, I love lemon curd! I'm also excited for the Wolfman movie. I generally do prefer old horror movies, but who can say no to Benicio?? Natalie, and they are not difficult to make! Michelle, I'm a sucker for lemon curd. Kate, thank you for your visit, I'm glad you like the recipe! It's crumbly on the edges and softer in the middle, where the filling goes. A Fork Full..., they look cute, don't they? Thank you! Ashley, I love lemon curd, too and it was my first having it in cookies. I think you would like these! I love anything lemon! 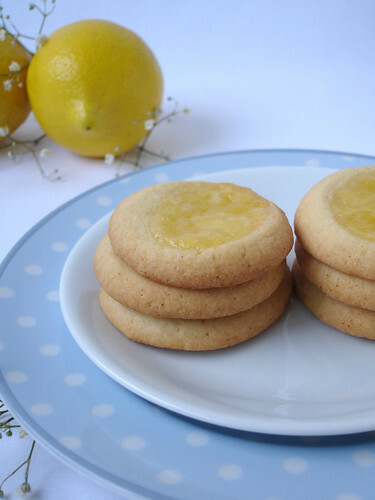 Lemon curd sounds amazing on a butter cookie. What a bright springtime treat! Oh yum! Those cookies look so pretty, and I'm willing to bet they are really refreshing too! These look great. I worked at a bakery where we made a similar cookie, but we rolled the sides of the dough in coconut first. It was my all time favorite. Thank you for your visit - I love lemon and coconut together, I'm sure those cookies you baked were amazing!